Want vs. choose. Sounds simple, right? Take a second, though, and think about what you want. What about what you choose. How different are they? Why? This question came about after hearing this concept from the book I am currently reading. I wanted a Tesla earlier this year. Instead, I chose a Toyota 4Runner. Of course, I also wanted a 4Runner, but due to the Tesla X’s $100+K price tag, I chose the vehicle that was a fraction of the cost. I could have also chosen a very simple 4Runner let alone a little Toyota Corolla. Instead, I chose the Limited set-up with 4×4. I wanted this more than the base SR5 package. If I was to step back further, my previous vehicle (2007 Toyota 4Runner Limited 4×4 with 115K miles) was still working great. It was all paid off. Yet, I chose to increase my personal burn rate by several hundreds of dollars because of want. This, despite wanting to return to startup and entrepreneurship after my time at SalesWise– a life change which would likely provide meager financial security for a while. Think about it. What do you want? What do you choose? Why? As I mentioned in my post last weekin asking the question, “who do you envy?”, I was listening to a Rich Roll podcast with Gretchen Ruben, author of The Happiness Project (podcast link here). She spoke with Rich about her latest project and book regarding the “Four Tendencies”. 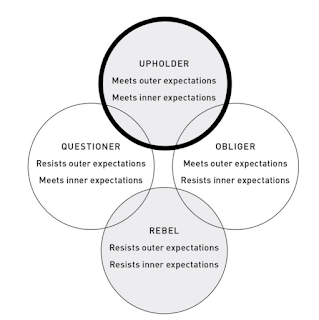 The Four Tendencies help identify how people respond to expectations – both outer and inner (extrinsic vs. intrinsic). She wanted to understand why people were able to sustain motivation or stick to goals. In effect, she created another personality test to help people connect and navigate relationships. 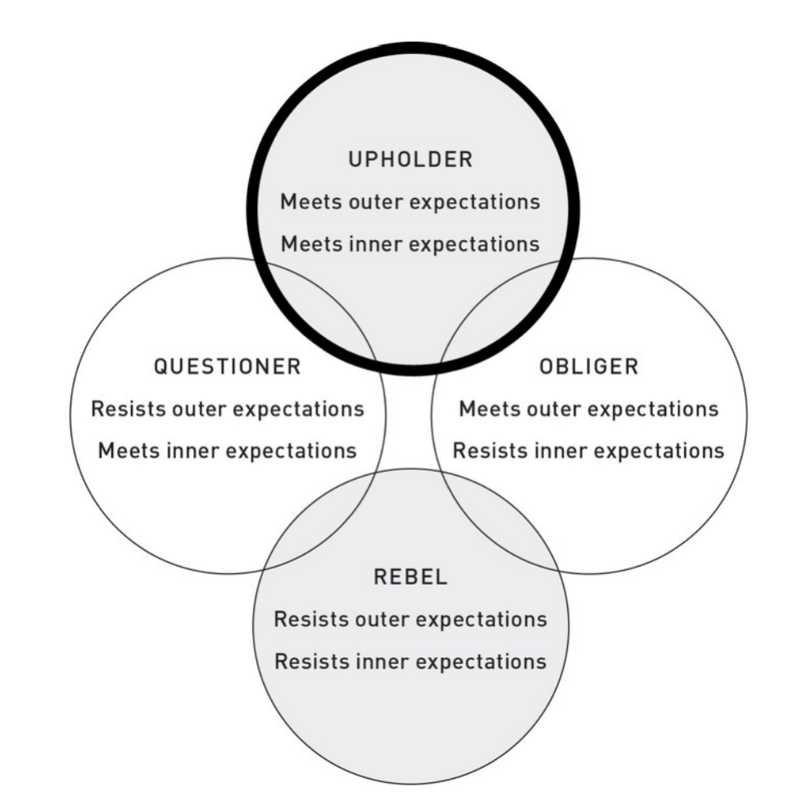 I took the test – I’m an Upholder. This makes a lot of sense as I have a strong ability to not only make self-commitments, but I carry them out. This applies to external (outer) expectations as well (e.g. family, boss, customers). You can take the test here. What’s your tendency? Agree or disagree? Culture and set behaviors are incredibly powerful. They affect every new employee, so that they, too, become engrained in the cultural norm. Oftentimes, we are not aware of them just because “that’s how it’s always been”, and we assume we asked the right, challenging questions before. However, it’s not the case. Sprinkle in hubris, and you have a never-ending cycle. Of course, these establishments also promote loads of opportunities for entrepreneurs and challengers to come in with a fresh take. Once value is realized amongst a few, change can happen. Then, perhaps it’s just a matter of time. I recently listened to the Rich Roll podcast featuring Gretchen Rubin, author of The Happiness Project (link to podcast). The question proposed by Gretchen points to what the person who is envied is, does, or has over the person envying. Oftentimes, we ask questions about regrets or what we want only for folks (myself included) to say we have no regrets or we don’t really want anything more than what we have (beyond the usual dreams). Personally, I can say there are a fair number of things I want. However, the thought of who I envy really draws out a deeper perspective. I ask why. Elon Musk, James Dyson, JK Rowling, David Beckham, Jack Ma. I envy them for their remarkable success. Success that was achieved by overcoming incredible failures and adversity. They stayed true to their beliefs and emerged victorious. My older brother and my best bud for raising beautiful families with their equally amazing spouses. This is the immediate list that comes to mind. However, I’m sure there are many more. http://www.daryllu.com/wp-content/uploads/2018/10/entrepreneurial-ninja_logo_sm.png 0 0 Daryl Lu http://www.daryllu.com/wp-content/uploads/2018/10/entrepreneurial-ninja_logo_sm.png Daryl Lu2017-10-11 01:57:002017-10-11 01:57:00Who Do You Envy? I’ve been thinking of how powerful money can be, and how businesses capture consumer surplus. Consumer surplus is an economic measure of consumer benefit, which is calculated by analyzing the difference between what consumers are willing and able to pay for a good or service relative to its market price, or what they actually do spend on the good or service. A consumer surplus occurs when the consumer is willing to pay more for a given product than the current market price. However, maybe it’s also this notion of consumer surplus that drives how businesses, government, etc. enable those who “have” versus those who “have not”. Consider for a moment how advantageous technologies and tools can be for startups, for example. Some tools enable these companies to flat out survive and build something meaningful. However, due to lack of resources (normally cash), startups are unable to leverage them (think legal, marketing automation, etc.). Or, think how fliers today can pay more to sit in first class versus upgrades to an airline’s most loyal, frequent travelers. Or, think of how money can elevate patients higher on the waiting list for state-of-the-art medical procedures versus individuals who have waited months or years. Or, when mortgage companies lower interest rates or provide premium cost savings opportunities to those who are financially secure when those who are still consistent in payments but have lower income do not qualify. This is a free market where competition reigns supreme. However, it comes at a cost to those who could potentially reap the greatest benefits – sometimes at a price of survival. Should money buy anything? Check it out – I’ve started a new site called Mmm Donut (www.mmmdonut.com). With my interest in donuts, I’ve decided to start Mmm Donut to write donut reviews. Unlike my previous blogs and sites such as 100 Strangers, 100 Days or even this Entrepreneurial Ninjablog, I will not have a set rhythm and cadence for Mmm Donut. Instead, I will try out different donuts and simply write about them – grading each on 7 Donutal Dimensions.